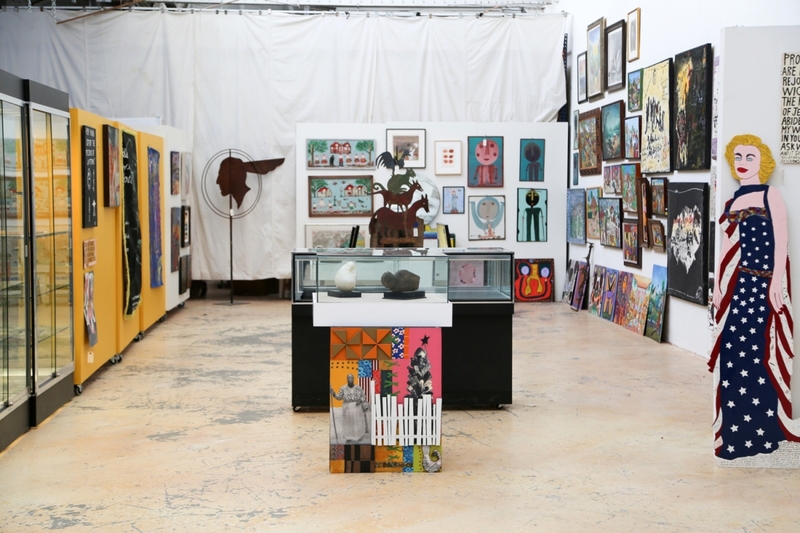 During preview, the gallery featured a nice mix of paintings and objects from local, national and international artists. 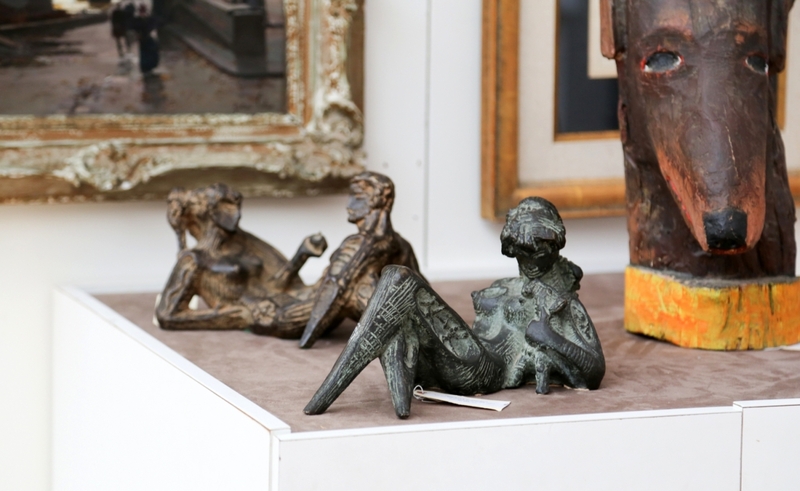 PHILADELPHIA – Philadelphia was in a whirl in the third week of April, as the city’s capstone antiques show got underway and auction sales dotted the map around it, offering buyers more objects and art than they could fill a small country with. 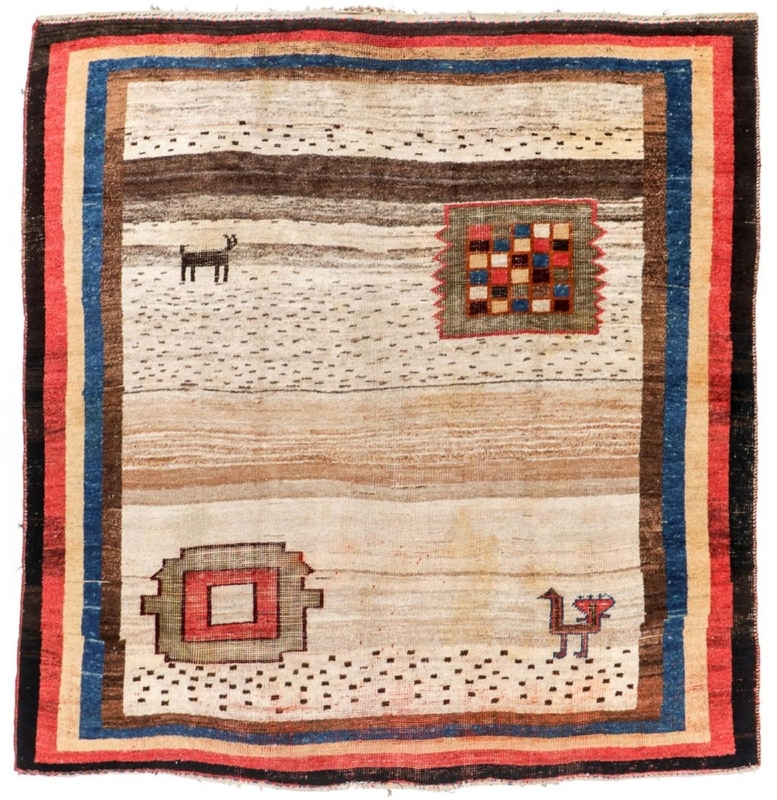 But everything was business as usual down at Material Culture, as the firm ran with a double-header that week, starting off with a 321-lot April 18 Oriental rug sale and finishing with a 271-lot April 22 fine, folk and outsider art auction. The firm has made a concerted effort in these two fields, offering sales in one of the two categories every month for the past few years, with single owner, tribal and general estate auctions thrown in intermittently. Leading off the Oriental rug sale was a monumental Tibetan monastery rug from a Philadelphia estate collection that brought $11,250. 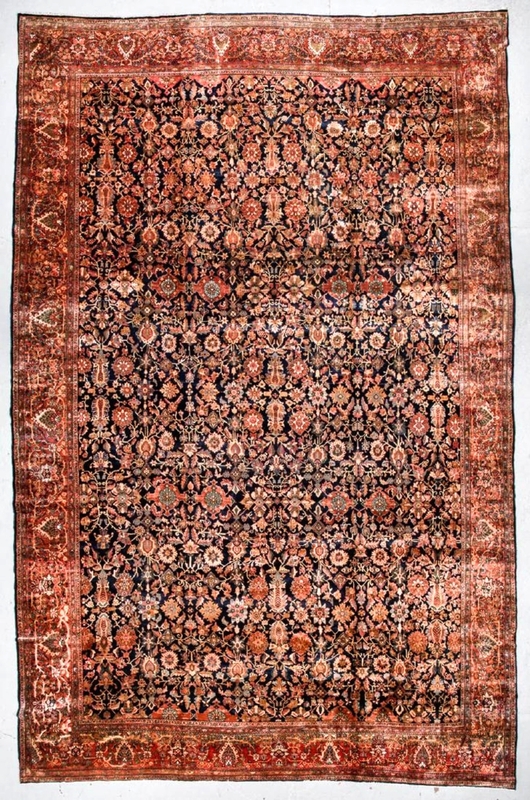 The circa 1900 carpet featured an appealing mix of burnt oranges and blues. 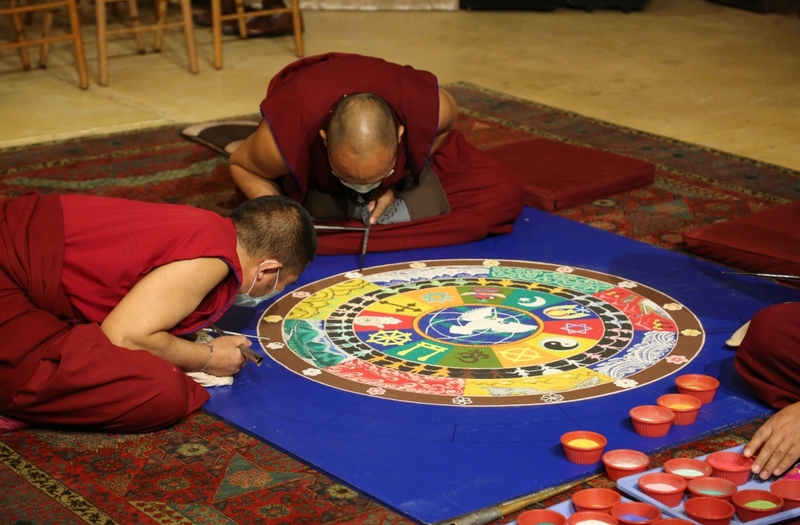 The Tibetan theme lent itself to more than just carpets, as the firm was also hosting a group of monks who were making a sand mandala in the lower level gallery during preview. 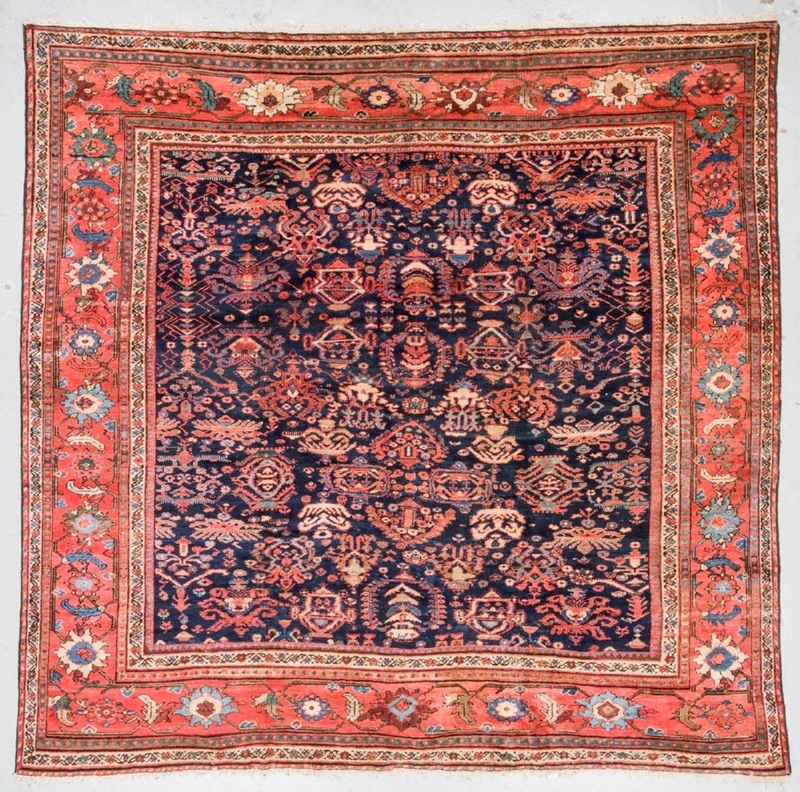 Following behind was an antique Bidjar rug that hailed from Persia at the turn of the century. At 13 feet by 20 feet 2 inches and with bright reds and blues, the lot sold for $7,500. Also in the same general size was a Persian blue Sarouk, which caught $5,937. There were carpets for all tastes and room sizes, all the way down to the smallest examples. 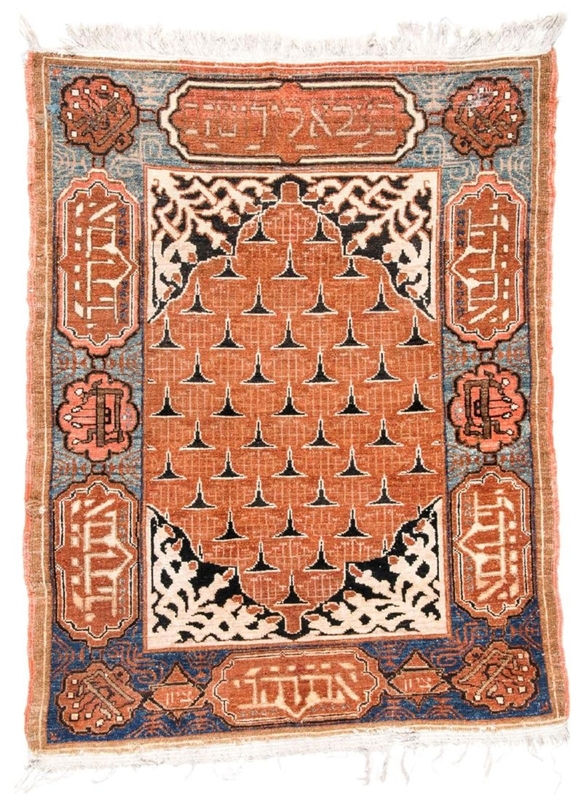 A 3-foot-11-inch-by-5-foot-2-inch Bezalel prayer rug caught the attention of bidders, as it took $5,625. The rug featured various Hebrew inscriptions, including the words “Bezalel,” “Jerusalem” and “Zion,” as well as a number of menorah forms in six places along the border. At $11,250, a monumental Tibetan monastery rug from a Philadelphia estate collection was the highest result among the carpets. While bargains were certainly had, there were a few surprise lots that did well above estimate. 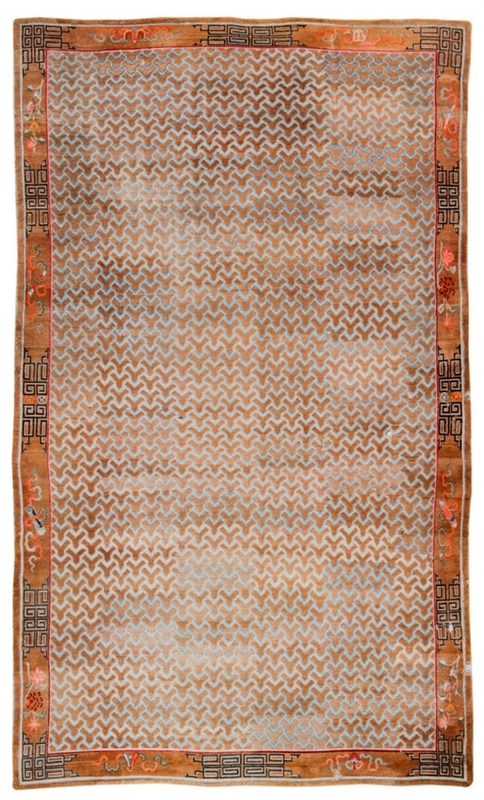 One of these was a semiantique, 6-foot-11-inch-by-9-foot-4-inch Moroccan rug with an olive green background that brought $1,875 on a $400 high estimate. Following that was a well-loved antique silk Kayseri rug, 9 feet 7 inches by 14 feet 9 inches, with some wear and losses that over doubled the $700 high estimate to finish at $1,750. 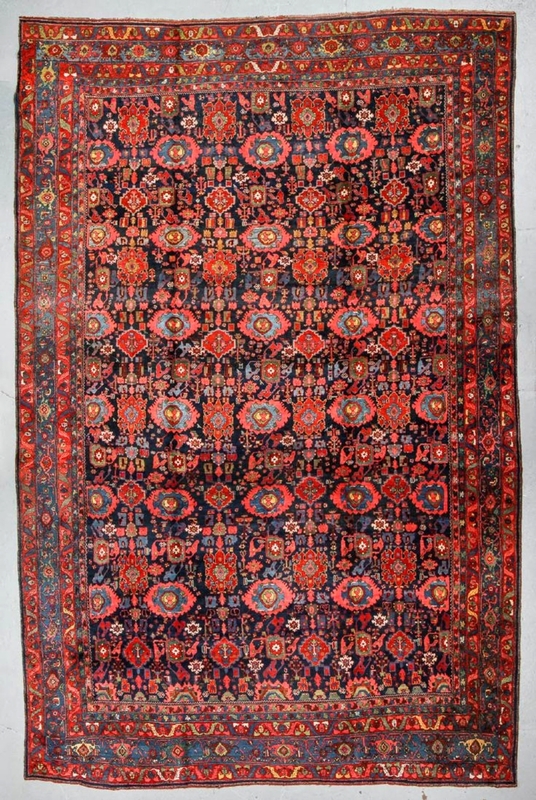 A Twentieth Century Gabbeh rug with bold colors in a 7-foot-3-inch-by-7-foot-8-inch size took $1,062 over the $500 estimate. 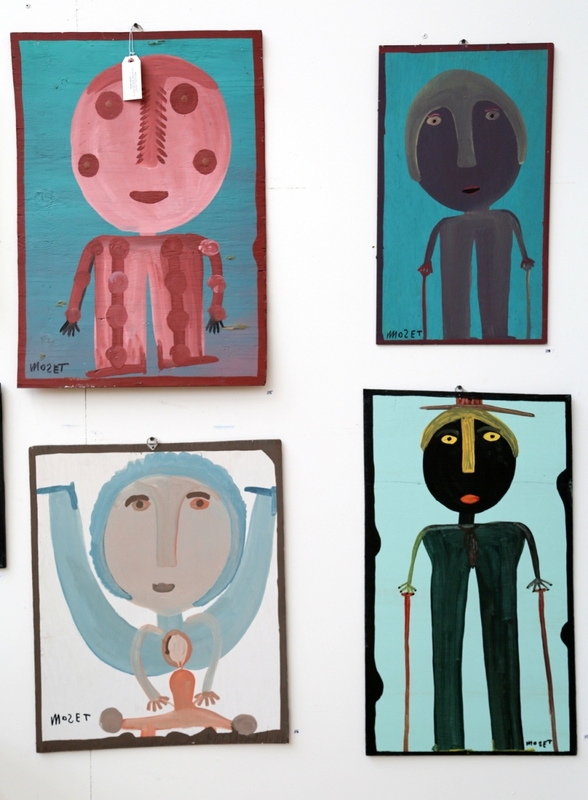 Shifting gears only four days later, the firm hosted a colorful and eclectic sale of fine, folk and outsider art on April 22. 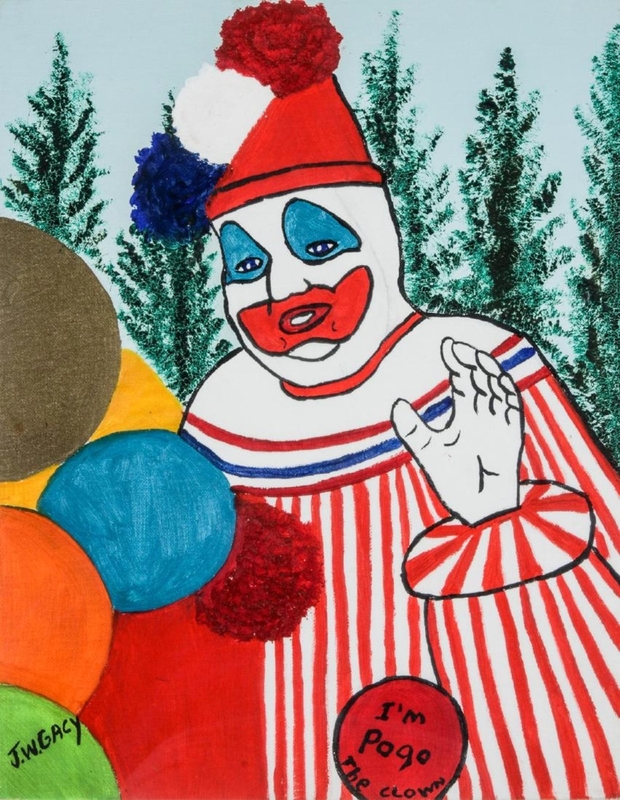 The auction featured a notable selection of works, 22 lots in all, by outsider artist and Baptist preacher Howard Finster (American, 1916-2001) that hailed from a Florida estate, some of them with provenance to Finster’s Paradise Garden. At the top of the sale was a notable Finster work, “Visionary Landscape, #4494,” a 48-by-48-inch painting on wood dated May 6, 1985. The visionary work, which brought $31,250, featured worshipers and angels walking along a stone-paved road between two sharply rising mountains, a broad landscape in the background dotted with small houses and trees, with Biblical messages written in areas. The frame was made by the preacher, as well. Finster was a fan of pop culture, often producing images of Coca-Cola bottles, Marilyn Monroe and, one of his favorite images, Elvis. Elvis accounted for four lots in the sale, two of which passed, but one that produced the second highest sale price overall. Dated 1955, which is considered an early work for the artist, was “Elvis,” a tractor enamel painting on board, which depicted Elvis Presley and Colonel Tom Parker on the set of the movie Love Me Tender. The 11-by-12½-inch painting brought $12,500. 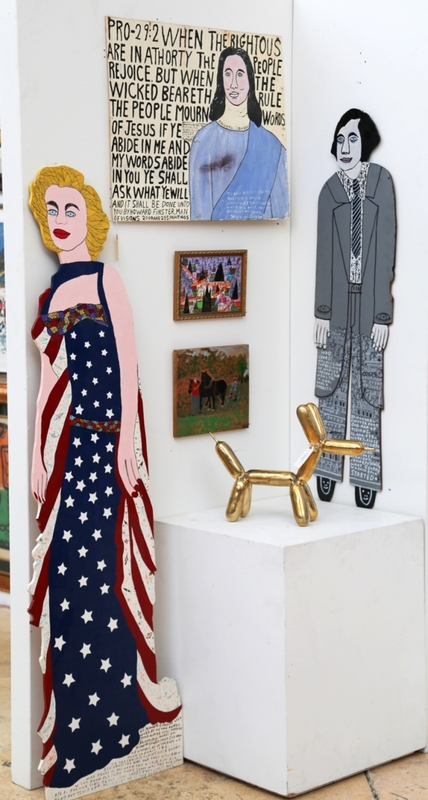 Finster’s cutouts still remain popular among buyers, with three of them performing near the top of the sale. At $10,625 was a 73-inch-high Marilyn Monroe dressed in an American flag gown. On the back of the figure, Finster continued to draw faces in the wood-grain, creating a double-sided work. 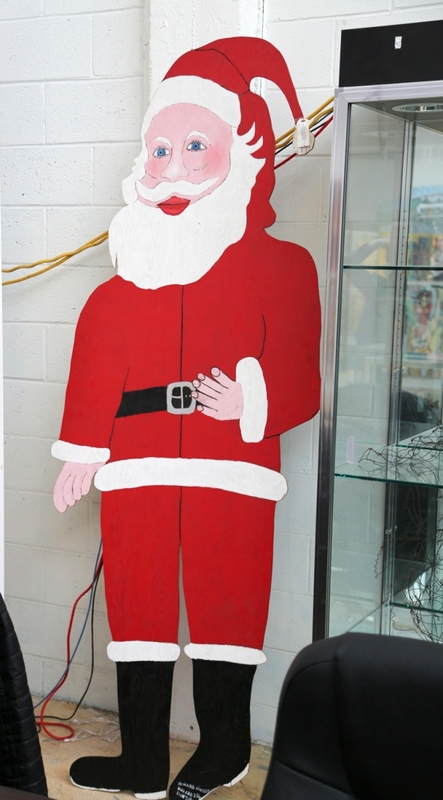 Behind was a larger than life, 92-inch-high Santa Claus, which finished at $8,750. It was the first example of St Nick that Finster had ever produced, and was by request of Jeffrey Camp and dated 1978. 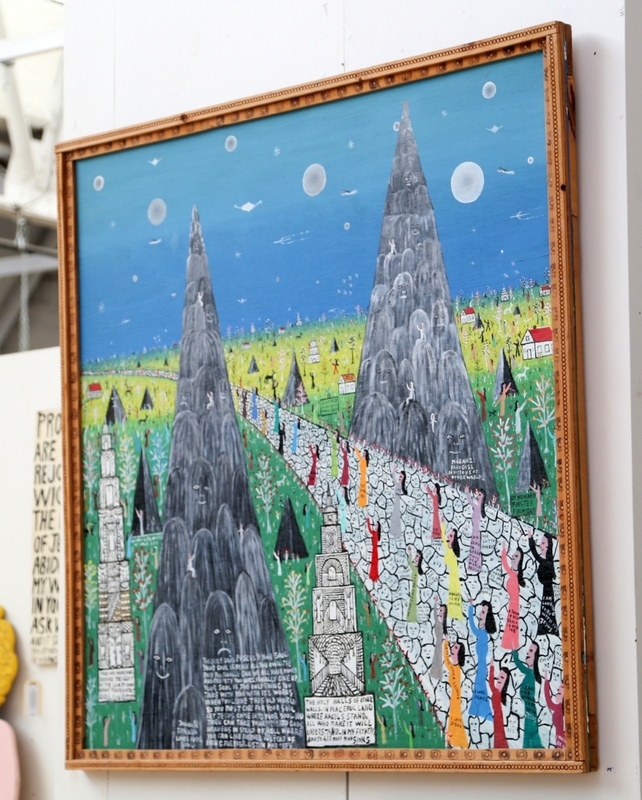 The top lot of the art sale was this 48-by-48-inch painting on wood painting by Howard Finster. “Visionary Landscape, #4494” caught $31,250, between the estimates. It was a highly detailed work from the artist in a large-scale format, featuring worshipers and angels walking along a stone-paved road between two sharply rising mountains. The frame was made by Finster as well. 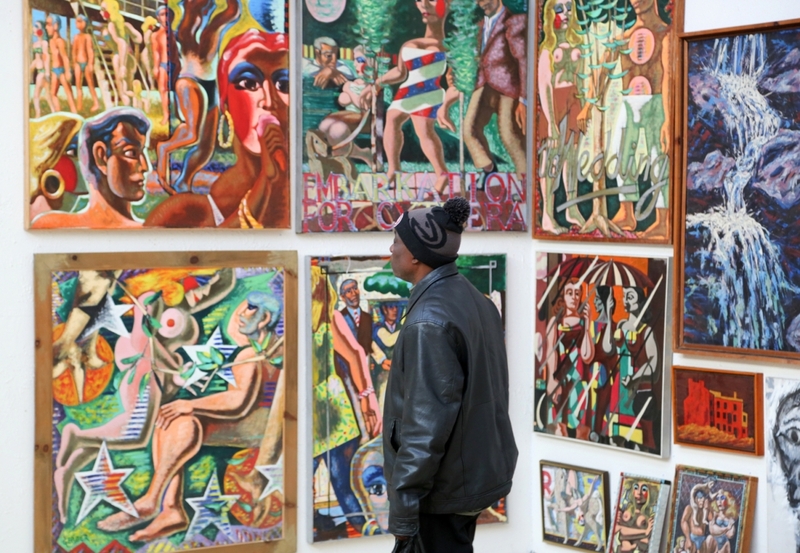 The sale also featured a number of works by Philadelphia artists, including art by Andrew Turner, Jack and Fred Gerber and the Tiberino family. All but one of the six Turner’s in the sale sold above high estimate. The lead work, a dark-hued tribal painting, a mixed media on board with a sight of 44¾ by 36½ inches brought $1,500. A 1962 painting on canvas titled “3 Women in the Rail” by Jack Gerber was the standout from that artist, as the 34¾-by-37-inch work sold for $937. When the house was cataloging Jack Gerber’s works, they also stumbled upon some carved and painted figures by his brother, Fred. The figures ranged from animals to busts, but the highest came in the form of two birds, an owl and a parrot, which brought $281. 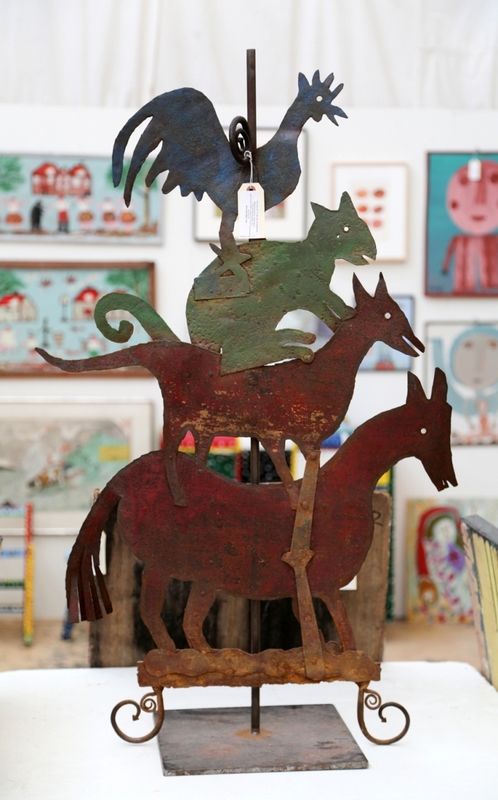 At $2,125, an early Twentieth Century Bremen Town Musicians sculpture made good on its estimate. The 41-inch-high iron sculpture featured a rooster atop a cat atop a dog atop a horse, each in a different vibrant color. The Bremen Town musicians were popularized by the Grimms’ Fairy Tales, published in 1819. All prices reported include the buyer’s premium. For additional information, www.materialculture.com or 215-849-8030. Out of seven Thornton Dial’s in the art sale, this one faired the highest. 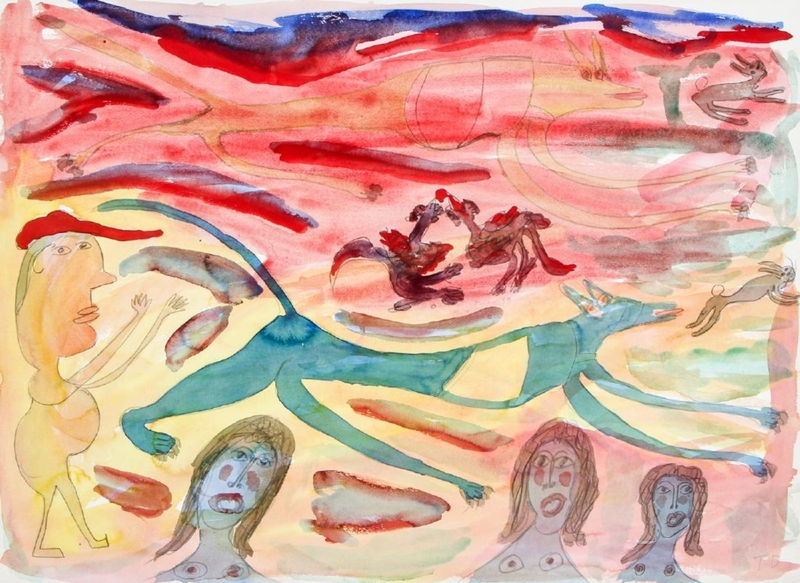 “Training the Dogs to Run,” 1991, mixed media watercolor painting on paper, 22 by 29¾ inches, $6,875.